1. To make the pickled cucumber, place 150ml cold water, the vinegar, sugar and star anise into a small saucepan and bring to the boil. Cook for 8-10 minutes or until reduced by one third. Remove from the heat and leave to cool. 2. Add the tarragon stalks, then using a vegetable peeler, cut long ribbons of cucumber into the pickling liquor. Alternatively use a sharp knife to cut into the thinnest possible slices. Cover and chill in the fridge for at least 6 hours, preferably overnight. 3. When ready to serve, mix all the crab ingredients, except the bread, together in a bowl then season. 4. Toast the sourdough and cut each piece in half. 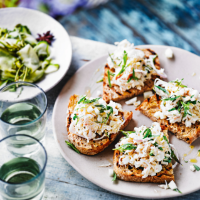 Spoon the crab onto the toast and serve with the cucumber salad alongside.